Welcome to my 'retirement dream home' which was custom built in 2011 to include amenities that I wanted in a home that I could share with my family & friends. A delayed retirement offers you an opportunity to enjoy all the pleasures & comforts of my beautiful home until I make this dream home my final residence. Located in a 24-lot gated community affording safety & privacy, the property is only 40 minutes to the Juan Santamaria International airport and is less than 10 minutes drive to downtown San Ramon where there is banking, shopping, hospital, pharmacies, churches, small mall with movie theater, numerous local & international cuisine restaurants as well as many more conveniences. 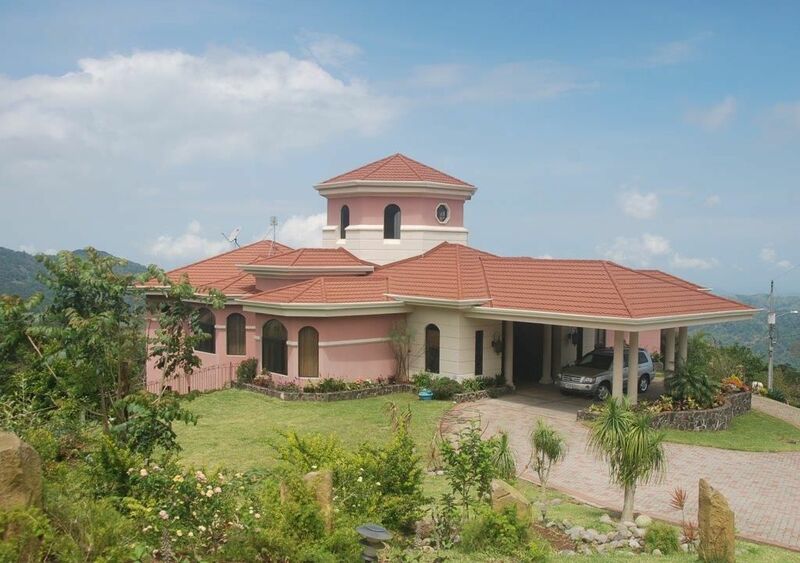 Each house in the development is situated on a spacious 5,000+ SM lot allowing for privacy. Currently there are 8 houses occupied by either fulltime or partial-year owner residents with another house under construction to be completed in 2014. Villa Rosa is centrally located in the development with a 360 degree view which encompasses both the gorgeous mountains as well as the Gulf of Nicoya & Pacific Ocean. You can enjoy the most fabulous sunsets from most rooms in the house as well as the main level terrace, the covered pool terrace and the pool deck. The paved, semi-circle drive at the front entrance of the house affords easy access & parking under the covered portico. The house is entered on the main level from this portico through custom iron & glass doors that lead into a large octagon-shaped atrium. Upon entering the house you will immediately be captivated by the elegance of the two-story atrium decorated with hanging tapestries with soaring tray ceilings illuminated with indirect recessed lighting and beautiful chandelier. The floor to ceiling glass doorway leads to a balcony opening to a view of the mountains & Gulf of Nicoya. From the 8-sided atrium there is access to the master bedroom, main floor guestroom, & the powder room through beautiful custom-crafted wood doors. The living, dining & kitchen areas and the stairs to the lower level are accessed through open doorways. The dining room is furnished with a Tuscan style formal dining room suite with a table with 8 chairs and matching glass curio cabinets. The dining room has a wonderful view of the Gulf of Nicoya and the infinity pool through the double glass doors leading to the covered terrace. Open the glass doors and enjoy the wonderful outdoors during your meals or enjoy sundowners on the adjoining covered terrace with its comfortable wicker sofa and chairs. In the area adjacent to the dining room is the living room furnished with comfortable sofa and chairs, large flat screen TV housed in a wall unit that also contains an electric fireplace that will take the chill off a cool morning or evening or provide lighted ambience when no heat is needed. The kitchen is separated from the living/dining areas by an open doorway and is equipped with stainless steel appliances that would delight any chef. These include Kitchen Aid double ovens with convection & steam assist options, induction cooktop, a large toaster/convection oven, microwave, trash compactor, garbage disposal, dishwasher, large farm sink, prep sink, French door refrigerator with ice & water in the door and espresso maker. The kitchen is furnished with elegant custom wood cabinets and granite countertops and includes a center island with 2 barstools. An exterior door leads from the kitchen to the outside terrace where there is a large gas grill equipped with rotisserie and separate burner. A large wooden cabinet is situated on the outside terrace stocked with all the acrylic ware you may need for meals outside on the terrace or by the pool. This outdoor cooking area is adjacent to the covered terrace accessible from the dining room and has stone steps leading to the pool-level covered terrace and the pool deck. The Master bedroom is located on the main level and is accessible from the atrium entrance through double wooden doors. The bedroom is furnished with a queen bed, matching night stands, a chaise and Asian inspired chairs & chest. The adjoining bathroom is equipped with a double-ended soaking tub and separate oversized shower, separate water closet with toilet & bidet, separate double vanity & makeup vanity and adjoining large walk-in closet and built-in bureaus. A large hot tub/spa is located on the private terrace accessed through sliding glass doors and the terrace is covered by a teak pergola. There are stone steps leading from the terrace to the pool below and an outside shower with both cold & hot water is conveniently located on the landing to wash off lotions & sunscreens before entering the spa. The main floor guest room is also accessible from the atrium entrance and is furnished with a king bed, large oversized dresser & mirror, 32 inch flat screen TV, adjoining bath with separate dressing area with double vanity & beautiful onyx vessel sinks & granite countertops, a double closet with sliding doors, and the separate shower & toilet area. The lower level is accessed by the stone-covered stairway from the main level atrium and you are immediately in the elegant octagon-shaped game room with unique leopard tile and comfortable sofa for seating while watching or participating in a game of pool on the regulation-sized Brunswick cherry wood pool table. Double decorative iron & glass doors equipped with screens lead from the game room to the pool deck so you can leave the doors open and be included in the activities at the pool. Adjacent to the game room is a gym equipped with Smooth Fitness elliptical, BowFlex Fitness gym, upright & recumbent stationery bicycles, and other miscellaneous fitness equipment as well as a 32 inch flat screen Smart TV to watch while exercising. There are double iron & glass doors leading from the gym to the outside lower garden area where you can sit and enjoy the outdoors and spend quiet time reading or visiting. 7. Guest room with pool access equipped with two twin day beds with trundles which can sleep 4 people. If the gym isn’t your cup of tea and you prefer outdoor exercise, take advantage of the safe neighborhood and walk the road which circles the neighborhood and look for birds and other wildlife along the way. You will need good gripping shoes as the road is not paved but it will give you a good workout with the rolling terrain. There is a massage table available if you wish to request a massage through Martin Rojas, the property manager. He can also arrange side trips to local tourist attractions, daily housekeeping services, take you shopping, secure someone to cook for you if desired, assist with party activities, etc. All of these additional services are to be arranged directly with Martin and fees for these services are separate from the rates and are to be paid directly to him. I retired in 2011 to finish construction on this house but left it in the hands of housesitters to return to work in the Spring of 2012. I plan to permanently retire in 2015 and will spend my time in Costa Rica and MS. I selected the development of Residencias Las Terrazas because it afforded privacy and services that were important to me. The central location of San Ramon is especially an advantage as you can easily reach the airport and private hospitals in San Jose/Escazu area within an hour as well as many tourist and recreational area. toilet, shower, Adjoins bedroom & accessible from pool area as well. 5.5 baths which includes baths adjoining all bedrooms plus an additional full bath on the lower level and a half bath on the main level near the living & dining rooms. Storage Garage below but not available for parking but covered portico at entrance of house. Gym with elliptical, stationery bikes, BowFlew Fitness gym and other miscellaneous equipment. Furnished with sofa, two side chairs & large chair with ottoman. Large flat screen TV in wall unit. Coffee maker upstairs & downstairs. Espresso Maker upstairs in main kitchen. Formal Dining with 8 chairs. 3 TVs in house. One in living room, one in Main Level Guest room and one in gym. Card games with poker chips, Horseshoes & Bocce ball available. Main Level accessible but not lower level. Dimension 1 Spa on MBR terrace. Beautiful home with fantastic views. We would definitely recommend this home for your trip to Costa Rica. Ava (owner) is very accessible giving us good information for our trip. Martin (local) is a wealth of local knowledge. He is Avery nice person and made our stay relaxing and enjoyable. It was a wonderful experience. Thank you David for your positive comments. I am so happy that you and your family enjoyed staying at Villa Rosa during your vacation to Costa Rica. This is an amazing house! The pictures do not do it justice! The views and sunsets are breathtaking. The amenities are top notch. But above all is Martin the caretaker who went above and beyond to ensure we had one of the most amazing family vacations. Grocery stores nearby and centrally located to make day trips to either La Fortuna, La Paz etc. The master bedroom is amazing and spacious. Beds very . comfortable. More bathrooms than you can use. The Pool área was perfect for relaxing and enjoying the view. The hot tub and sauna amazing. This one is a great choice!! Thanks again Martin for making our vacation! Thank you very much for your review. I am so glad your vacation was a success and I totally agree with you that my good friend and property manager, Martin Rojas, is absolutely an awesome host. I hope you come back to stay again. Jay, thanks so much for your very [positive review and I am so happy that you and your family enjoyed your stay at my property in Costa Rica. I'm sure that potential guests will find the information you provided in your review very helpful when selecting a property to stay. I hope you have the opportunity to visit Costa Rica again and that you will come back and stay with me again. Enjoy the upcoming Christmas Holiday and I wish you and your family a very happy and prosperous New Year. Ava is an excellent host, Martin is also excellent and helpful with anything you might need. Excellent location, close to everything. Thank you for the review, Jackie. I am so glad your family enjoyed your stay and I hope you come again. The house was amazing, with spacious rooms and beautiful decor. Everything you need is at your fingertips. The views are spectacular with the valley spread below and the ocean and mountains in the background. On our next trip to Costa Rica, we will definitely be staying at this magnificent place. Thank you so much for your review. Please come back and stay with me again when you are in the San Ramon area. We (8 of us, 2 families, all adults) stayed in this house for a few days in July, 2016. Truly an amazing house. The views, sunsets and surrounding area was spectacular. We try to rent houses that have fabulous views and this did not disappoint. We had rented a house close to the coast and want to also stay somewhere closer to San Jose. Most of us had visited Costa Rica a number of time so we did not need to do much sightseeing. When we arrived, we realized we didn't want to leave, we wanted to relax and enjoy the surroundings. The infinity pool and the pool area is beautiful but depending on the time of year you visit, some people could find it cool to swim much. We did spend some time swimming. The hot tub is AMAZING! I think we didn't really have enough time to absorb and enjoy all this house has to offer. From the downstairs gym, pool table, sauna etc. We just didn't have enough days! If the bedroom configuration works for your family, then you will not be disappointed with this house. This house was the safest I have ever felt in Costa Rica. We did go into San Jose, but too much traffic etc and don't need to go again! I know there were other places to visit nearby, but we had seen Poas a number of times and we were happy spending time with each other and relaxing in the beautiful surroundings . Thank you Ava, for sharing your beautiful house with us. You have created a relaxing oasis. Thank you so much for providing a review for your stay and I am happy to hear that you and your fellow travelers enjoyed your stay. I will work on getting that pool a bit warmer but it is difficult with the night winds we have at the 3500 ft. altitude. I hope you come back and stay longer next time when you need a place for some down time and relaxation. The Magallanes area of San Ramon is located just off Highway 1 with easy access to many tourist attractions including Poas Volcano and Lapaz Waterfalls, Arenal Lake & Volcano for fabulous zip lining, mountain bike trails and thermal hot springs, Playa Dona Ana is a local beach where monkey families will entertain you with their antics and Jaco and Punteranus are both just an easy drive for deep sea fishing, sunbathing and nice restaurants.